Another surge in Italian bond yields to euro-era records has spooked investors…Adding to the angst is the decision on Wednesday by LCH.Clearnet, the clearing house, to raise the initial margin required to trade Italian bonds. Such a move makes it more expensive to hold a position and may encourage investors to quit trades, putting further downward pressure on prices and forcing yields higher. 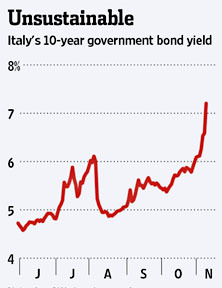 Italian 10-year yields hit a fresh record of 7.48 per cent shortly after the European open. They are currently up 49 basis points at 7.26. Crucially, the yield curve has inverted as 5-years trade at 7.49 per cent, a condition that speaks of real investor fears about a potential default. Unless the European Central Bank (ECB) steps in, Italy will be shut out of the bond market very quickly. It will be unable to roll over its debt, and default will follow. This is basically Greece on steroids, since Italy is something like six times bigger than Greece. The eurozone deal announced a couple of weeks ago might have been big enough to handle a Greek collapse—though even that’s not a sure thing—but it’s not even close to being big enough to handle an Italian collapse. It’s not easy to figure out what happens next. The ECB seems to be dead set against an unconditional backstop of Italy, which is probably what it would take to calm investors. And yet, an Italian collapse is unthinkable to European leaders. The rock and the hard place have truly started their final destructive squeeze. Forget Herman Cain. This is the biggest story in the world right now.